Will these signs soon be a thng of the past? 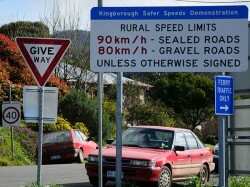 The Kingborough Safer Speed Demonstration was commenced in September 2007. In September this year Infrastructure Minister David O’Byrne announced an initiative under the Safer Roads: Non-Urban Road Network Strategy to consider the reduction of speed limits in current 100km/h zones to 90km/h. As part of the consultation process, councils are required to nominate roads that they consider to be suitable to retain the 100km/h limit. As a result, Council is seeking the community’s input into which roads it considers to be suitable for the 100km/h limit to be retained. All suggestions or questions regarding the initiative can be directed to kc@kingborough.tas.gov.au or Council’s Engineering Services Department on 6211 8161. 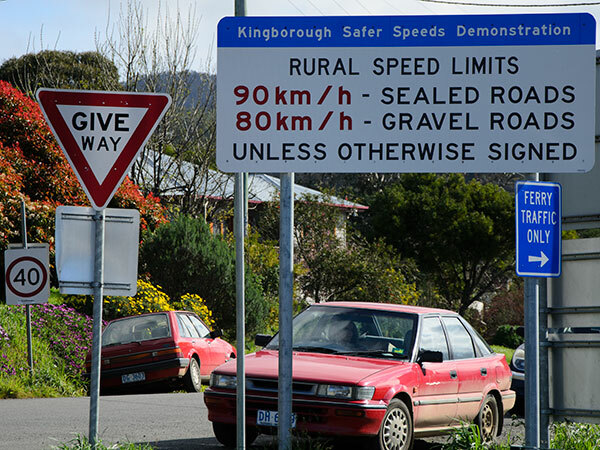 A Legislative Council Select Committee has been formed to look into Rural Road Speed Limits. The terms of reference are quite broad: to inquire into and report upon the issue of the Government’s proposed rural road speed limit reduction from 100km/h on sealed roads and the potential impacts/benefits on the communities; and any other matters incidental thereto. Last year the RACT campaigned vigorously against a blanket approach to reducing rural speed limits. The motoring organisation is now conducting a survey to provide input for a submission to the Legislative Council Committee. Submissions to the Committee close on Friday 18 January 2013. Click here to complete the RACT Survey.